During the late 1800s, painters in Europe were in search of new ways to express themselves. Impressionism was a major movement that came to prominence during the 1870s and 1880s. Shortly thereafter, Neo-Impressionism made its entry. The term “Neo-Impressionism” was coined by French art critic, Félix Fénéon, in 1886 to describe an exciting art movement founded by artist Georges Seurat and his friends. 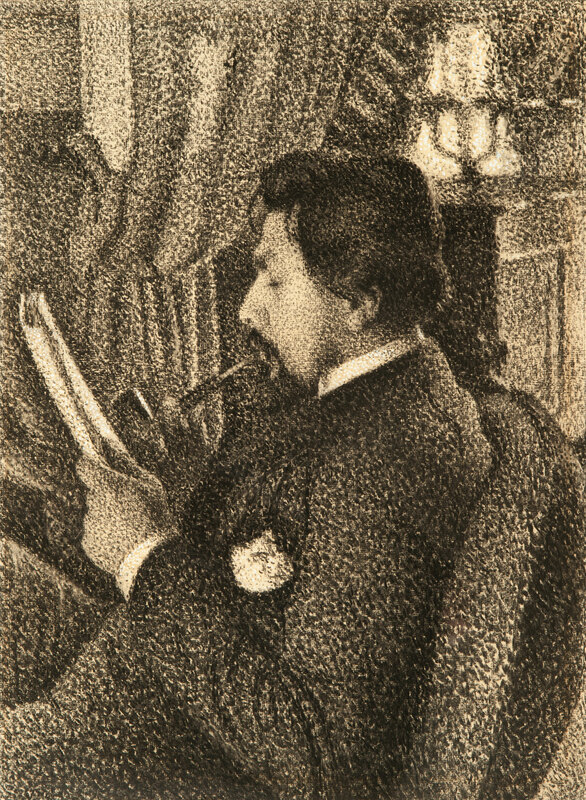 In 1886, Seurat and this new group of artists presented its first exhibition as the Société des Artistes Indépendants (Salon des Indépendants), in Paris. Seurat’s iconic painting, “A Sunday Afternoon on the Island of La Grande Jatte,” was featured in the exhibition, and marked the beginning of this dynamic movement that also included Paul Signac, Camille Pissarro, among other masters. 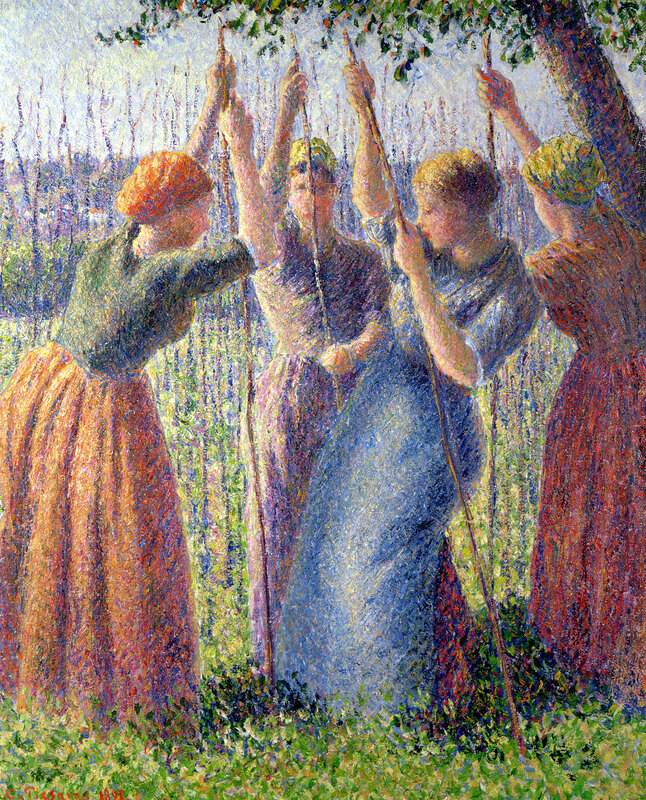 Pointillism is the style most often associated with this new artistic direction because it was the first technique that dominated the movement. Characterized by the use of dots, Pointillism provided a sense of compositional organization. It also transpired during the scientific development of optic and color perceptions at the time, particularly that of Michel Eugène Chevreul’s development of color theory. There were other significant factors that played key roles in shaping the Neo-Impressionist style. Together, Neo-Impressionist painters and Symbolist writers, poets and composers launched a fruitful ongoing dialogue about the role of the imagination in art. Focus changed to the inner world of dreams, intangible reality and spiritualism, which was a radical departure from previous artists who focused on communicating the visual world through exact representation and tangible form. Camille Pissarro, Peasant Women Planting Poles in the Ground, 1891. Oil on canvas. 21 1/4 x 18 1/8 in. On loan from a Private Collection, Museums Sheffield, UK. “Neo-Impressionism and the Dream of Realities” is an outstanding current exhibition presented at The Phillips Collection, a museum in Washington, DC, that illuminates this pivotal time in art and history. The exhibition, which runs through January 11, 2015, reflects the Neo-Impressionist’s preoccupation with “the idea, emotion, or the synergy of senses”, highlighting the period from 1888 to 1895. More than 70 works are featured in this show, that includes 15 of the most renowned artists such as Georges Seurat, Paul Signac, and Camille Pissarro alongside their lesser known contemporaries. Many of the works on view in this exhibition have rarely or never been previously exhibited in the United States. This exhibition, organized by The Phillips Collection, demonstrates that followers of Neo-Impressionism were drawn to evocative figural subjects, modern urban scenes as well as idealized landscapes and seashores. Their new freedom of expression was also ignited by their interest in literature and music. Georges Lemmen, Portrait of Jan Toorop, 1886. Chalk on paper, 23 x 17 in. Collection Museum de Fundatie, Heino/Wijhe en Zwolle, The Netherlands. The building that houses The Phillips Collection combines the former home of its founder, Duncan Phillips, with new expanded galleries. Phillips was an art collector and critic who was instrumental in introducing America to modern art. He was also the grandson of James H. Laughlin, a banker and co-founder of the Jones and Laughlin Steel Company. Currently thriving in Washington’s vibrant Dupont Circle neighborhood, the collection has expanded to comprise masterpieces by modern and contemporary artists, such as Renoir, Rothko, Bonnard, O’Keeffe, van Gogh, Diebenkorn, among many other impressionist and modern masters. The collection continues to develop with selective new acquisitions, many by contemporary artists. The museum is also known for its important Center for the Study of Modern Art, an environment for collaboration, innovation, engagement with the world, scholarship, and new forms of public participation. Its array of stimulating programs and events includes Conversations with Artists, symposia, lectures, Sunday Concerts, and more. In addition, the museum serves thousands of students and teachers through its award-winning program of educational outreach.